We’re kicking off the workshops from October 2014 at venues around Nillumbik Shire. Stay tuned to this page for details and announcements! Who is Team Better Build? The volunteer crew behind Better Build is currently Craig Byatt (holistic architect), Paul Pitrone (sustainable designer & builder) and Liz Franzmann (digital engagement & group facilitator). Craig and Paul were interested in sharing their combined knowledge & experience through community workshops and Liz was keen to help make this happen. And they all love building stuff! We believe learning is good. We believe learning by doing is better. We believe learning by doing, while socialising over a shared, tasty meal is best! Getting to know people in your local ‘hood while making something satisfying, with your own hands, is one way to ‘better build’ a strong, connected community. Sharing means caring…for ourselves and the planet. Why buy it if you can borrow it? We’re testing this idea by joining the Brunswick Tool Library to borrow extra workshop tools & materials, if we can’t find them shared on Streetbank. Want to join Team Better Build? 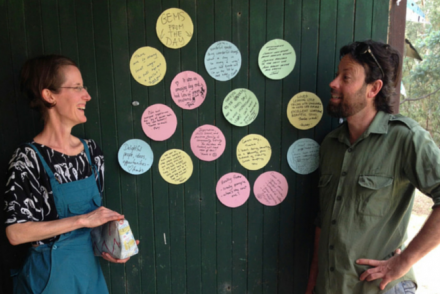 While the Better Build idea was originally the brainchild of Craig, Paul & Liz, the Team is always on the lookout for Nillumbik locals interested in helping organise, promote & run the workshops. You don’t need any particular expertise other than a desire to help out. Hit us up on this page or send us an email at hello@thegroupfactor.com.au if you’re keen to get involved. Good luck guys! Sounds like a great idea!